I know that the best opportunity for there to be interest in these photos was as soon as possible after the event — or even tweeted or posted to Instagram or Facebook at the time — but the problem with fixating on the media moment is that, nine days later, no one notices that the problem that needed highlighted has now been forgotten. And yet, of course, as I regularly explain, the prison at Guantánamo Bay, where men are held indefinitely without charge or trial, or, if charged, are held in a broken system incapable of delivering justice, is a legal, moral and ethical abomination, and every day it is open is a source of shame for all decent Americans. And so those of us who care about the ever-pressing need for Guantánamo to be closed must keep on finding ways of preventing it from being forgotten — ten days after the anniversary, 20 days after, a month after, three months after, six months after and so on. The photo project referred to above is ongoing, with posters for 6,300 days on April 11, 6,400 days on July 20 and 6,500 days on October 28, and I invite you to get involved in sending in photos on those dates, and also to visit and share another ongoing Close Guantánamo initiative, the Gitmo Clock, which counts in real time how long Guantánamo has been open, and urges Donald Trump to close it. I’ll also continue to focus on the stories of the Guantánamo prisoners, and to mark significant anniversaries throughout the year, but, as myself and other campaigners realized in Washington, D.C. and New York over the last two weeks, we also need to take the opportunity that has arisen through the Democrats taking control of the House of Representatives in November to follow up on preliminary meetings that were organized through campaigners and took place in Washington, D.C. last week, focusing on the need for Democrats to get Guantánamo back on their radar, and also to understand the significance of Donald Trump’s decision to close the Office of the Envoy for Guantánamo Closure, set up under Barack Obama, which arranged prisoner resettlements and monitored released prisoners for national security reasons, which I wrote about last year, in an article entitled, Guantánamo’s Lost Diaspora: How Donald Trump’s Closure of the Office Monitoring Ex-Prisoners is Bad for Them – and US Security, in which I explained how Trump’s decision to close the envoy’s office has endangered some former prisoners, and may even have led to the deaths of two Libyans repatriated to Senegal after being resettled in Senegal. If you’re interested in being involved in these ongoing efforts to get Guantánamo back on the political radar, then please get in touch, and also feel free to contact your Senators and your Representatives, especially those Democrats in the House who might be interested in addressing the shameful and unwavering injustice that is Guantánamo. 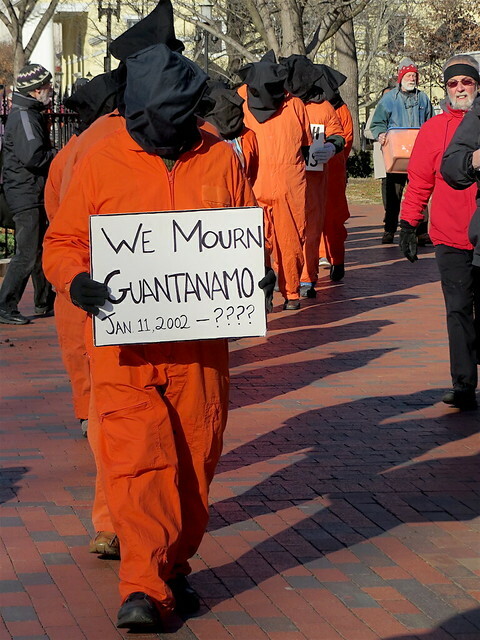 Here’s my latest article, linking to my photo set, on Flickr, of the vigil outside the White House on January 11, the 17th anniversary of the opening of the prison at Guantanamo Bay, featuring Witness Against Torture campaigners, in hoods and orange jumpsuits, and speakers from a number of participating organizations, including Maha Hilal​ of the Justice for Muslims Collective, Medea Benjamin​ of CODEPINK, and Maria Luisa Rosal​ of School of the Americas Watch. Yes, Witness Against Torture certainly know how to put on a good show to remind the world of what it means to be a Guantanamo prisoner, Natalia!